Mrs. ReaderPants: Check out my chick lit genre tree! Check out my chick lit genre tree! I don't know about other schools in the U.S., but schools here in Texas can be very touchy about Christmas trees or other Christmas decor in the building. This is sad to me since so many kids really love seeing the glowing lights. 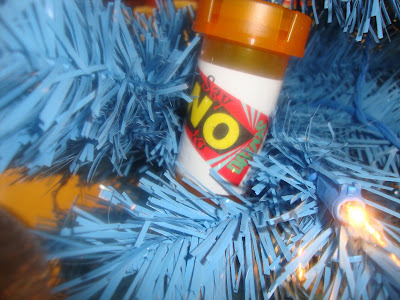 I think a pretty Christmas tree adds so much to the season, and it is sad to me that so many schools have banned them. 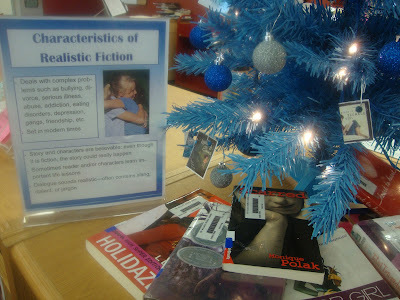 I am not here to debate the merits or drawbacks of having a Christmas tree in the school library. Schools have to do what they have to do, even if many people disagree with it. I totally get that. This is a solution I came up with in my library. Several months ago, my aide and I and my 10 fabulous student library aides genre-fied our entire fiction collection. Each of 14 genres got a color-coded spine label and a new location in the library. We do all kinds of things to promote the genres in our library including a "genre of the month" and lessons with classes to help students really understand the differences between the genres. This Christmas, my aide and I wanted to put up a Christmas tree in the library but felt some pressure not to do so (my district has never forbidden it, but I know it's a touchy subject). And the genre tree project was born. At this time of year, Wal-Mart, Big Lots, and other stores sell colored, pre-lit Christmas trees. Here in Texas, my local Wal-Mart has black, purple, pink, white, green, and blue pre-lit Christmas trees (3.5' tall). I've also seen smaller ones in red, lime green, and orange. 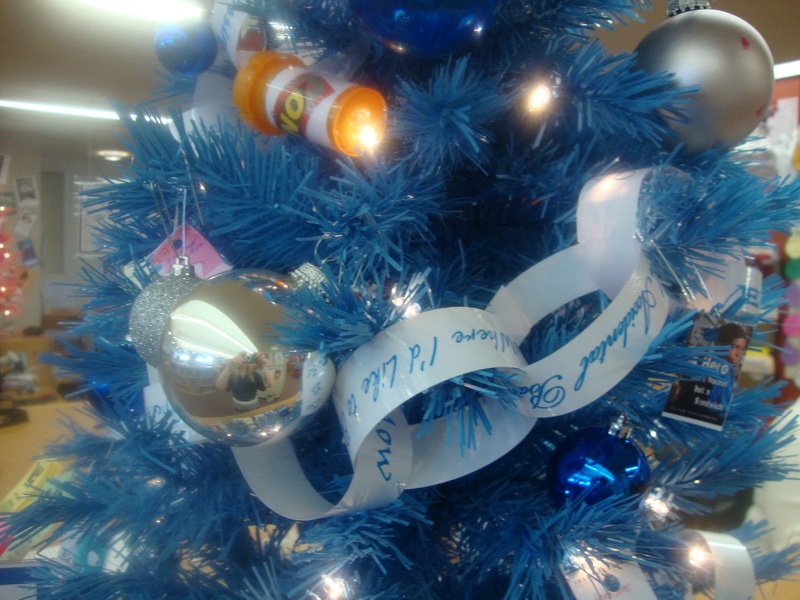 Since our our library genres come in all these colors and more, we thought it would be fun to decorate multiple trees to reflect and promote the genres. multiple "chick lit-esque" ornaments--found lots of glittery pink clay ornaments of purses, words (LOL, Diva), high heel shoes, etc. A sheet of 4 ornaments was $1.97. Paper Chain--I typed and printed a list of maybe 50-60 of our chick lit books. All were in a hot pink font, and I used many different font styles. Cut those into strips to create a paper chain to use as garland. Book Cover Ornaments--I printed several chick lit book covers (small, to fit my small tree). Cut out and laminated these (cut them out, then laminate them to prevent peeling). Punched hole in top and strung on large paper clips to hang on tree. "Presents" Under Tree--I fanned out several chick lit books with interesting covers from our library. As they get checked out, I replace with new chick lit books. Angel at Top--My 7-year old son made that colorful and glittery angel at the top. If I didn't have that, I would have made a large heart to put at the top. A red high heel might be neat if you have one that will work (I don't). 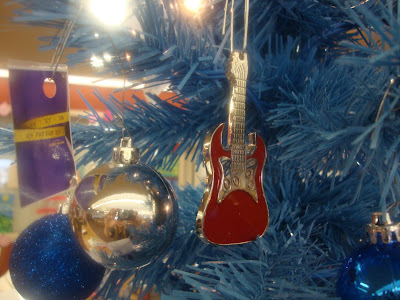 Other possible ornaments--barbie shoes, lipstick cases, small mirrors, laminated pictures from fashion magazines, etc. I also made a sign to denote that it is a "chick lit" tree. My students loved the chick lit tree today, and a few of the books underneath the tree got checked out. Had some requests for a horror tree next (black), so I guess I'd better go ahead and start looking for some skull garland and fang ornaments! New for Christmas 2013--Fantasy tree (purple)!!!!! I could not do half the stuff I do without my amazing library aide. Sadly, her position may be on the chopping block next school year. If that happens, I'll be stuck behind the counter pretty much all the time. YUCK. I will so be stealing this. It's taken me a couple of years, but I am genrefying this summer, while I move the entire library around! Yay! Congratulations on your genre-fication! I'll be genre-fying a new library next school year, too. Lots of work but so incredibly worth it! 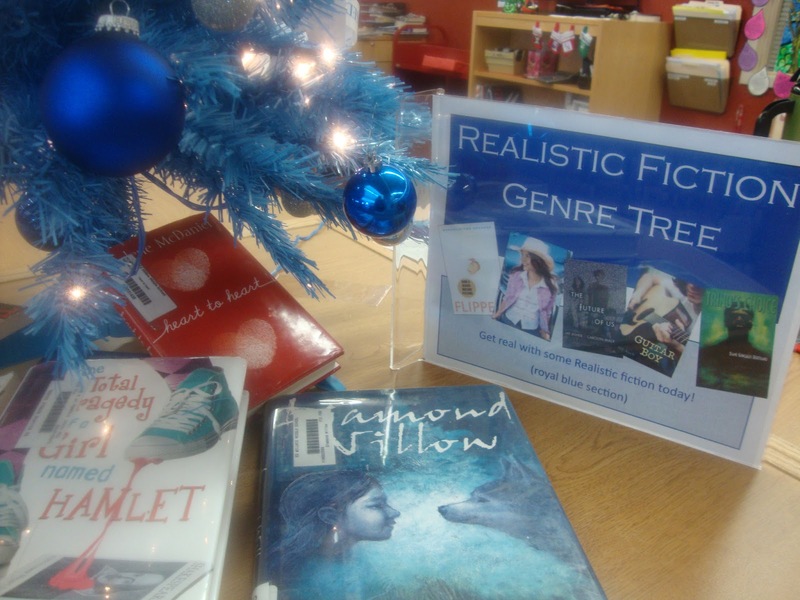 Love this idea...Just finished my 5th genre tree..lots of work but totally worth it. I couldn't find an neon orange for my sports so i spray painted a white one...Just so you it looks great..Thanks for all the good ideas.